Mother of the Bride, I love to share wedding photo ideas with you from time to time so you can share them with your daughter. If she loves a particular photo idea, she might want to pass it along to her photographer—or ask you to keep a list of ideas or start a Pinterest board to save them on. Better for your daughter to share her desires with the photographer than hope he or she is a mind-reader and magically captures the shots she’d really like to have, right? 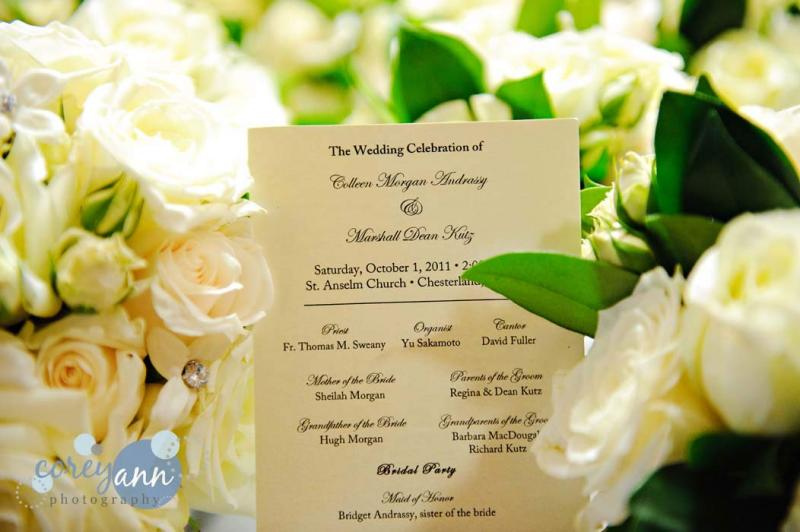 Today’s idea frames the wedding program in flowers. Don’t you love the beautiful shot above? All that’s needed are the bridal bouquets and the program, and voila—an elegant photo of the wedding program amid a sea of gorgeous flowers. Why not pass this idea along to your little girl turned bride, MOB? She may think it’s the perfect way to save a memory of the program. And I would have to agree! *You might also like to read Idea for Displaying Programs: A Basket and A Keepsake Photo of the Wedding Invitation. You might like to take a look at my Wedding Photography Pinterest board as well. *The new issue of Life Notes, my quarterly inspirational newsletter, came out last week. It’s not too late to receive it. I feature a giveaway in every regularly scheduled issue so don’t miss out. Sign-up is free and to the right!